"Caffe Florian Venice...its beautiful interiors, with plenty of old mirrors and frescoed ceilings gives you an opportunity to live it up a little..."
The Europeans, and especially the Venetians, must have liked coffee very much as in the first half of the 18th Century there were about 34 different coffee shops underneath those very arcades. Apart from Caffe Florian in Venice, there are only 2 others who have survived since: “Quadri” and “Lavena” which you will find on the opposite side of the square. 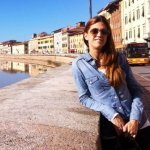 What made Caffe Florian Venice different? 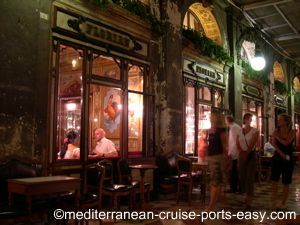 However, from the very beginning, Caffe Florian in Venice distinguished itself for a few reasons. First of all, thanks to the personalities of its owner Floriano and his grandson Valentino. Floriano was a real mine of social information on the city, back in the day. If you needed any information about anything… you went to Floriano. If you were leaving Venice, you would leave your card and itineraries with Floriano in case someone might be looking for you. If you were a new-comer, you would go to Floriano to find out the whereabouts of those you were looking for. Secondly, it was the fact that Caffe Florian in Venice witnessed the birth of “Gazzetta Veneta”, because the creator and editor of this newspaper chose Florian as his main editorial office and distribution centre! Thirdly, throughout its history, Caffe Florian in Venice served as a meeting place and rendezvous point for many a famous writer, poet, artist and intellectual including Charles Dickens, Marcel Proust, D’Annunzio and Eleonora Duse, Chateaubriand, Rousseau, Stravinsky, Modigliani, Goethe, Lord Byron (who supposedly loved having his breakfast here) and the infamous Casanova who came in search not just of his daily caffeine fix, but also of female company. Namely, at that time Caffe Florian in Venice was the only café in the city that allowed women to enter too. DINING-ROOM TABLE TIDBIT: The story goes that after Casanova escaped from the Doge’s Palace prisons on the 1st November 1756, he popped into Caffe Florian in Venice for a quick coffee before he fled to Paris! 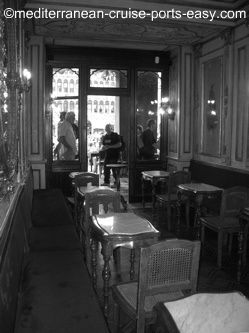 Caffe Florian’s beautiful interiors, with plenty of old mirrors and frescoed ceilings, and its outside tables and chairs (whether under the colonnades of St. Mark’s, or in the actual square itself) gives you an opportunity to live it up a little. The Senate Room, where the Venice Biennale was born, decorated with images of the world’s arts and sciences. Room of the Illustrious Men, named after the prominent Venetian figures portrayed in the medallion oil paintings. Room of Seasons or of Mirrors, still sometimes called The Restaurant, as it served as the café’s dining room in the 1930s. The Oriental Room and The Chinese Room, decorated with oriental motifs. Liberty Room, has an arched vault and original hand-painted mirrors from the early 1900s. However, most choose to sit outside so they can soak up the music played by the live mini orchestra, from April to October. TIP: If you’re just looking to have a very quick espresso or small drink, you don’t have to sit down at one of the tables and pay more. 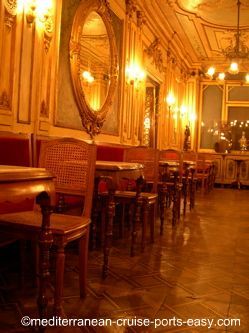 Head further into Café Florian, to the back, and you can sit at one of the little stools by the bar. But remember, you will be expected to be quick! Now, let’s be realistic, Florian café is expensive, and definitely not the place to go if you’re on a strict budget… but it certainly is an amazing setting. 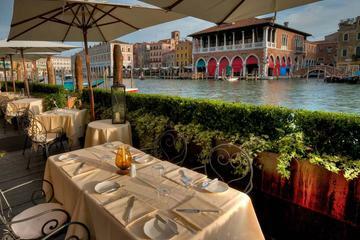 Perhaps even one of the most memorable experiences you’ll have on your visit to Venice. So, let’s prepare you so that you’re not completely taken by surprise… you ready for this? Sitting down? Ok, here goes…you can expect to pay €8,50 for a cappuccino and €6 for an espresso! 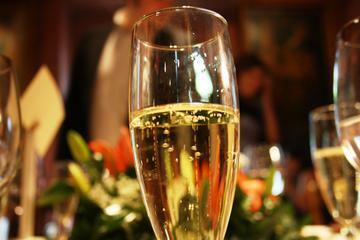 A nice plus is that if you’re having drinks or a cocktail, they do typically also come with a small assortment of nibbles. If it suits your taste, make sure you try a “cioccolata calda con panna” (hot chocolate with cream), it’s delicious! DINING-ROOM TABLE TIDBIT: In 2009, a Caffe Florian opened at Harrod’s in London. 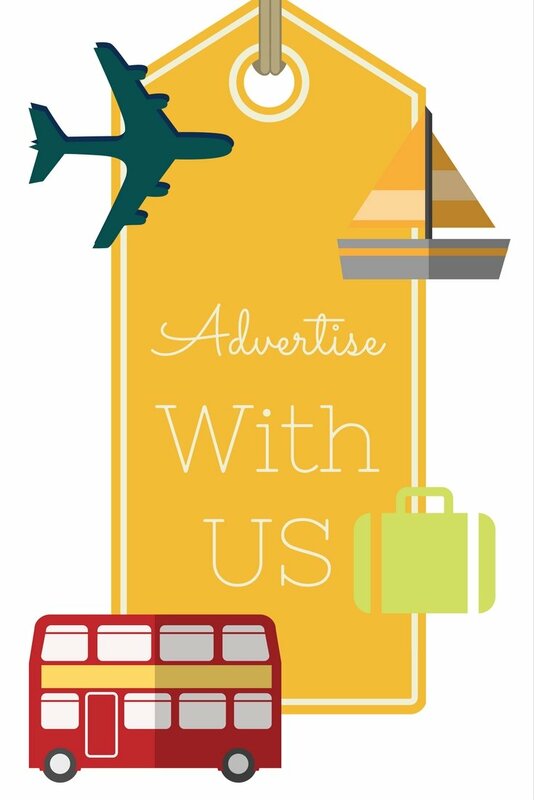 We also like to think of it this way… while you’re doing your sightseeing, running between the Doge’s Palace and the Basilica di San Marco, Rialto Bridge and the Bridge of Sighs, you’re bound to have a coffee somewhere. So why not do it in one of the most famous cafes on the face of the earth? Who knows when you’re coming back to Venice anyway, right? DINING-ROOM TABLE TIDBIT: In the movie “The Talented Mr. Ripley”, one of the last scenes was actually shot at Café Florian! It is a very good spot to people watch too, and when the quartet is playing it’s very interesting to be caught up in the sort of battle that goes back and forth between different quartets in the square. Each of them taking turns it seems, at trying to attract the most crowds. Keep in mind that you will pay an extra cover charge for sitting down and listening to the music. TIP: If you go earlier in the morning before the orchestra arrives, you won’t have to pay for the usual extra music charge. At Florian café, you will receive old-fashioned European-style service by smart white-jacketed waiters. But having said this, there is always the possibility you might catch that waiter having a bad day, or is simply fed up of tourists… but hey that can happen anywhere! 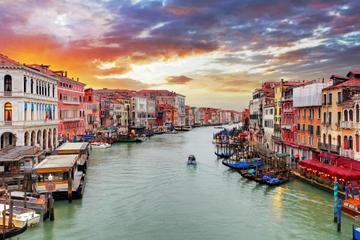 Highlights: Learn about how Eastern traders of exotic products changed the culture of Venice, visit Rialto market, some of the finest gothic churches and a fine Venetian coffee-roasting house.